I'm so excited to be teaming up with Prettymints to giveaway three of these gorgeous bauble necklaces. 1. "Like" Prettymints on Facebook here and sign up for the Prettymints mailing list located at the bottom of their website here. 2. Follow Fash Boulevard on BlogLovin here or Facebook here. 3. And don't forget to leave a comment below with your e-mail address in case you're one of the lucky winners. Open to US residents only. Winners will be chosen next Saturday, April 27th! WINNERS: Congratulations to the three lucky winners Heather Sanborn, Sharon Morgan, and Grace Inman. Major thanks to everyone who entered. Don't miss today my Rock outfit with quilted leather biker....and amazing suede cowboy boots. That necklace is really pretty. I like how you styled it with the neon and the pastels. Amazing outfit!!! I really love your style girl!!!! I like the necklace very much! The pictures and outfit are amazing. 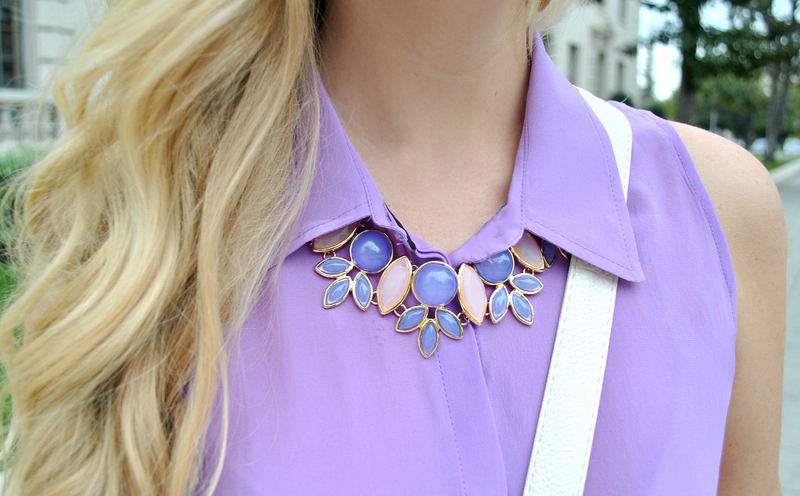 Love that color combo and the necklace is gorg!! Love it! Great outfit you styled with it! LOVE the pink and purble together!! These pastels are so pretty! The necklace perfectly brings it together! Love the whole outfit and such a pretty necklace! Cute outfit. Also I love your bracelets. Where are they from? I liked them on Facebook, joined their mailing list, and follow you on Bloglovin'. Also...the hat is a great compliment to your outfit! I liked them on Facebook, and joined their mailing list and already follow you on facebook and bloglovin'. I love the lavender top! So fresh for spring. love that colors matched ! i follow you on bloglovin, liked them on facebook, and signed up for the mailing list - ladiesinnavy@gmail.com. what a great giveaway!! I am really into these jewelry boutiques online now..so many beautiful, unique pieces to enjoy!! :) Thanks so much!! Check, check, and check! Thanks so much for the opportunity to win such a great giveaway! What a necklace...I love what you've paired it with!! Loving the pastels together. The necklace is gorgeous. You always look so cute and are styled so well! I love this look! You look gorgeous, as always!! Love the pink cutoffs, you def glammed those up! And kind of jealous...your hair is always perfect!!! I love the combo of purple and pink! And this necklace giveaway is amazing! Liked,following you and signed up! Adorable! Love those colors together. I just love your arm candy! Love the outfit, especially the Pretty Mints necklace! Hoping to be one of the lucky winners!!! Liked and followed all! Love the necklace! So cute, would love to win! Lovely!! The one you're wearing is so cute with pink and lavender! Thank you for a wonderful giveaway! I follow Prettymints on FB and signed up for their email list. I follow you via Bloglovin' and FB. First off, thank you for always staying in contact and checking out my blog all the time! It means the world to me! Secondly, I LOVE this outfit and the jewellery. Lastly, you look so gorgeous its crazy! great necklaces, perfection for spring!! I completed all steps! Love your gorgeous pastels! I completed the steps!! -those necklaces are amazing! I ADORE this color combo! SO pretty!!! Beautiful! I followed the steps. Your outfit is adorable! I love the pink shorts. Such a cute necklace! Hope I win! wow!!! you have such great taste! it's cuch a fresh feeling to look at your outfit.! I've just started to get into accessorizing. The whole idea is so daunting I have no idea where to start. I love sites like prettymints for this reason. I liked on facebook, joined the mailing list and luckily am already following you on Bloglovin! Beautiful necklace, would love to have it! Great giveaway. :) That necklace is gorgeous. Hey Anna! I would LOVE to win one of these necklaces! i love love love my jewelry and this would be the perfect addition! Its the perfect all year staple that i would get so much use out of! I greatly appreciate the chance to win! Great post as always and keep up the good work! Exceptionally gorgeous jewelry!! Especially love the necklace!! I love the periwinkle shade of your shirt!! Great giveaway! You look so pretty! Love the colors! Awesome giveaway! GORGEOUS NECKLACE! I did all requirements! sweetstylesbymelissa@gmail.com for the mailing list! Would LOVE to win this great giveaway I'm desperate need of a spring/summer bauble necklace. Liked Prettymints & Fashboulevard on FB, on Prettymints email list and follow Fashboulevard on Bloglovin. bigtoybox@hotmail.com liked and followed for the prettymints giveaway. Following both Fash Boulevard and Prettymints on Facebook. Love love love the necklace! LOVE this outfit!! SO CUTE!! and I LOVE all the Prettymints jewelery!! Hope to win! SO SO Pretty! Love me some statement necklaces! I am following both you and Prettymints! Love the outfit, as always!! Done and done...thank you for the giveaway!! I'm obsessed with this outfit and just had to go back and comment! This colorblocking is so pretty and you look effortless!